It is said that before a monk paints an icon he will enter into a period of fasting and prayer and that the first icon he will paint will be an icon of the Transfiguration. The icon, in the Eastern tradition, occu­pies an exalted position. It is a window opening on to divine mysteries. It is a revelation. Rather, the icon is God’s work. It is a prophetic act, proposed not in words but in images. It is a sacrament. The icon of the Transfiguration, repro­duced on this page – an icon similar to countless others that have used the same details and styles – shows the reaction at once of fear and awe in the disciples. They fall. they sleep, yet they see. Glory overcomes their human concepts. This moment of revelation produces dark­ness through an excess of light. Contrasting with the three disciples, on the upper plane, standing, is Jesus accom­panied by Moses and Elijah. The disciples fall because Jesus stands. They cover their faces because he is revealed in brilliant robes. From his face glory streams. Moses and Elijah are his companions more even than are Peter, James and John. Jesus is more properly a citizen of heaven than a sojourner on earth. The mountain, the light, the positions of standing and falling, glory and sleep – these are powerful symbols that touch the very bases of our human persons. The icon is powerful because it deals with essentials. The glory of Christ both overwhelms and exalts. It touches the heart of man and gives hope. The faithful know that portrayed before them is their own destiny. Jesus is revealed and he is the Head. 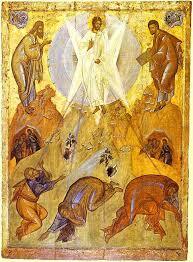 The whole Body will, in turn, be transfigured. The icon is a light shining in the dark­ness and giving a guarantee that our mortal bodies, like the paint on the artist’s easel, will be made manifestations of some­thing glorious, ineffable. Like all revelation, the icon is to be received as the gift of God for our healing and sanctification. In the way that man is an image (eikon – icon) of God, the icon is an image of the image. As Christ, in his incarnate reality, reveals God, so the icon reveals Christ. Just as the Christian worships Christ and sees the Father, so the Christian venerates the icon and sees Christ com­municated in it. The correct approach to an icon is of paramount importance. Questions about styles and categories and techniques are dangerous. They can destroy the work. They are useful only in a passing way. The icon is to be revered because it manifests the One we worship. The icon, when revered for what it is, imprints itself on the mindful heart and thence on the whole person of the faithful so that he becomes transfigured and sees the whole world as charged with the glory of God. The icon is given for the people. It is not arcane. It is given so that people might believe. It portrays but is no attempt at realism. It is beautiful, yet its purpose is not aesthetic. By contrast, much of our most imagina­tive Western religious art has become obscure. Is this not true of the works submitted for the Blake Prize? How much of our “best” modern religious art seems designed for the connoisseur? It has lost contact with the people. It does not speak to the heart. On the other hand, the religious art which is readily available in Australia is kitsch. There is a need to learn, from the icon tradition, the purpose of religious art: to reveal to the people the glory of Christ.